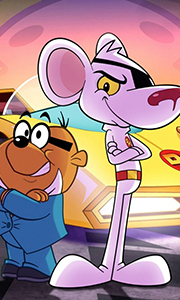 The worlds greatest mouse detective, Danger Mouse, with the aid of his bumbling sidekick, Penfold, embark on six devilishly dangerous and definitely death-defying missions! Long Lost Crown Affair Down in the jungle something stirs, its Danger Mouse and Penfold searching for the lost crown of Questabottle! By George, its a Dragon Wales is suffering from the rampaging of a fearsome dragon. Danger Mouse and Penfold go hunting! Projec..
Own Danger Mouse - Merry Christmouse DVD from Deff, DVD, Blu-Ray & 4K Video Specialists - Free UK Delivery..
Own Danger Mouse - Saves The World DVD from Deff, DVD, Blu-Ray & 4K Video Specialists - Free UK Delivery..
Own Danger Mouse - The Mouse Awakens DVD from Deff, DVD, Blu-Ray & 4K Video Specialists - Free UK Delivery..
Own Danger Mouse - From Duck To Dawn DVD from Deff, DVD, Blu-Ray & 4K Video Specialists - Free UK Delivery..
Own Danger Mouse - The Agent Who Saved Summer DVD from Deff, DVD, Blu-Ray & 4K Video Specialists - Free UK Delivery..
Own Danger Mouse DVD from Deff, DVD, Blu-Ray & 4K Video Specialists - Free UK Delivery..